Central business frontage. Currently occupied by Henty St "Books and Gifts". Property area 0.3Ha (3000 sqm) Three bedroom hardi-plank home. Aluminum windows, solid timber kitchen. Open plan living. Electric oven, gas cook top. Bathroom with separate shower and bath. Covered in sun room with views overlooking swimming pool and views to the rolling hills and Glenelg river. Outdoor pizza oven, town water. Garage (work shop and storage shed) and carport. Magnificent rural views. Nothing more to do but move in and enjoy. Quality home in good location. Three good size bedrooms. 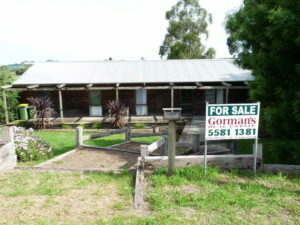 Walking distance to local shops and school. Weatherboard home with high ceilings and hallway. Kitchen with loads of cupboards and walk-in pantry. Lounge with reverse cycle air conditioner. Fully fenced, new roof and single garage. A spacious family home with striking new open plan kitchen, wonderful north facing 2nd living area over-looking the rolling hills and Glenelg river flats. Large lounge room, complete with wood heater and reverse cycle air conditioner. Kitchen is equipped with electric stove and oven plus dishwasher. The hallway flows to 3 bedrooms and bathroom. New laundry There is an undercover area at the front and rear of the home, ideal for entertaining. Sound system attached to decking Outside toilet attached to shed/garage. 6 car garage, 2 new rain water tanks (approx 5000 gallon each). Close to hospital. Rain water and town water and a large 20m x 7m shed with power connected. This 3 bedroom stone home situated just off the main street. With lots of character inside and out. Leadlight windows, polished boards and carpeted home is fully insulated plus Coonara wood fire and reverse cycle air conditioner. The kitchen is fully equipped with electric fan forced oven and cook-top. Two bathrooms, 2 toilets, solar hot water service. and single garage. Former CBA bank Modern brick veneer building fronting main street. Rear entrance to back yard. One tellers position, and Managers office. Vault and tea room. Securely fenced. ATM lease back $6,000 per year (inclusive of GST) Outstanding opportunity to secure modern premises.